This week we have started by giving news about cheap android tablets, Onda VX610A is one of them. The Onda VX610A is a 7 inch Android tablet running Android 2.2 OS and powered by a Rockchip RK2818 processor. This is an under $100 Android 2.2 Tablet. Some of the main features of Onda VX610A tablet have been highlighted below. The Onda VX610A tablet has a 7 inch resistive touchscreen with the same 800×480 pixel resolution. The device is capable of 720p video playback. It has no camera but a built-in microphone for voice chat. 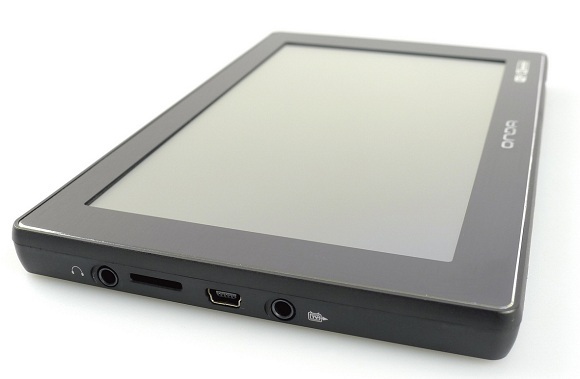 The Onda VX610A tablet has a very simple design as seen in the above photo. It has a mini USB 2.0 port for transferring data. Other features include Wi-Fi, gravity sensor, built-in speakers, microSD card slot, 8GB internal memory etc. The Onda VX610A Android 2.2 tablet is available for 500 Yuan or roughly 77 USD, which is so far the cheapest 7 inch Android 2.2 tablet on earth.